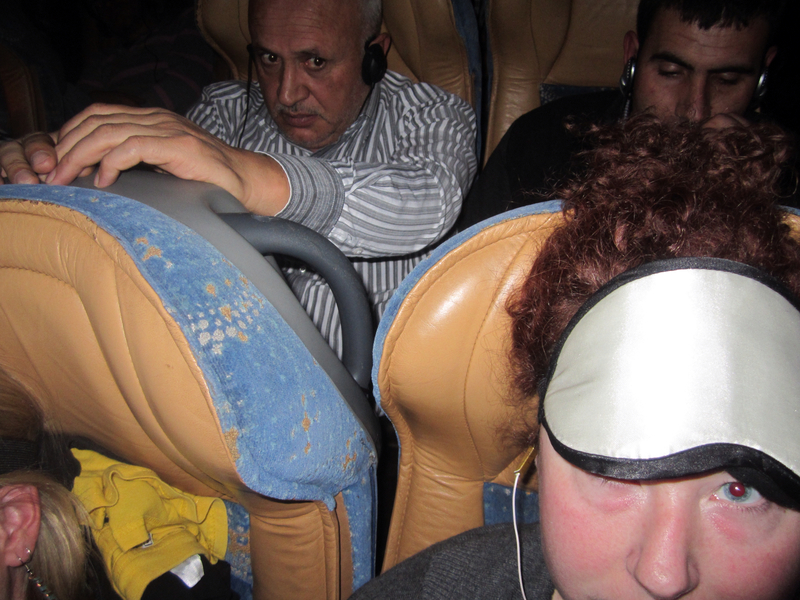 Summer and I took an overnight sleeper bus to return to Istanbul from Cappadocia, Turkey. After an exhausting couple of days there, we were really looking forward to putting on our eye masks, taking sleeping pills and waking up in Istanbul the following morning. So we hunkered down in our assigned seats, in the third row from the back on the left-hand side. Summer was awakened by the attendant, who asked her to move her seatback into the upright position. She complied at first, thinking that the man behind her needed to get out or something, but after she realized he was just sitting there, she reclined again. I fell asleep shortly after but then the attendant woke ME up, and proceeded to tell me to sit up. I said "No! I'm sleeping!" because I've ridden enough buses to know about the guy behind you who thinks he can tell you you can't recline, but doesn't have enough guts to do it himself and so he calls the attendant over to tell you. On a sleeper bus. Forget you, you tattletale jerk. It is my right to recline! I am an American! Summer got involved and we tried our best to fight the situation. The attendant didn't take 'no' and he didn't take our temper tantrum for an answer either, and forcefully moved my seat up and then left the scene. I screamed after him, "this is a sleeper bus!" in vain. I secretly plotted to just recline again when a little time had passed. But I could feel the man behind me pushing against my seat. I tried time and time again to recline, but could not. This is going to sound like an exaggeration, but it isn't: Two hours passed. He kept pushing. I was unable to sleep of course. One, I was sitting straight up...and Two, I was really angry. I continued trying to recline, but that man pushed my seat forward for a full two hours. Evidentiary proof. Look at his crazy eyes! Eventually he did have to pee, and when he did you better believe I reclined my seat ALL the way and slept like a baby (in his lap) for the rest of the trip.